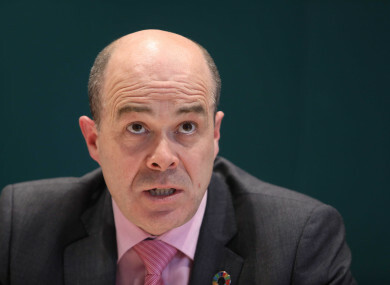 EMBATTLED COMMUNICATIONS MINISTER Denis Naughten has announced he is to resign his position. Speaking in the Dáil this afternoon, Naughten said he had a meeting with the Taoiseach last night, in which Leo Varadkar asked him to reflect on his position. “The Taoiseach does not have confidence in me,” he said. Naughten said he was left in a difficult position, where the opposition had not called for him to step aside, nor had the Taoiseach, but added that he had to reflect himself. Do I wait for that decision myself, to resign, or do I wait for someone else to make that decision for me? He said the outcome “is more about opinion polls than telephone polls. It’s more about optics than fibre optics”. Naughten has been in the spotlight following revelations about a dinner he had with the head of the only group bidding for the National Broadband Plan contract. Naughten admitted to attending a dinner with David McCourt – head of the Granahan McCourt consortium – in New York in July, while yesterday it emerged that the minister facilitated a lunch in the Dáil for McCourt’s daughter in April. He told the Dáil today that he had offered to pass over the NBP process to his junior minister, or to another line Cabinet minister, but this offer was refused by the Taoiseach. Speaking to TheJournal.ie today about the matter, Varadkar revealed that while he was still seeking clarity on protocols that prevent the minister from influencing the procurement process, he was nonetheless happy with the explanation Naughten gave him last night. He said: “I don’t have all the information yet. I’m certainly satisfied with what he said to me last night at the meeting. After his speech the minister left the chamber. Speaking after his resignation today, his counterpart in Fianna Fáil, Timmy Dooley, said he had “great sympathy” for Naughten today, and for his family and constituency. A number of TDs have called for the Taoiseach to come before the Dáil this afternoon. On a side note, the Department of Communications website is down. Email “Denis Naughten has resigned as Communications Minister ”. Feedback on “Denis Naughten has resigned as Communications Minister ”.